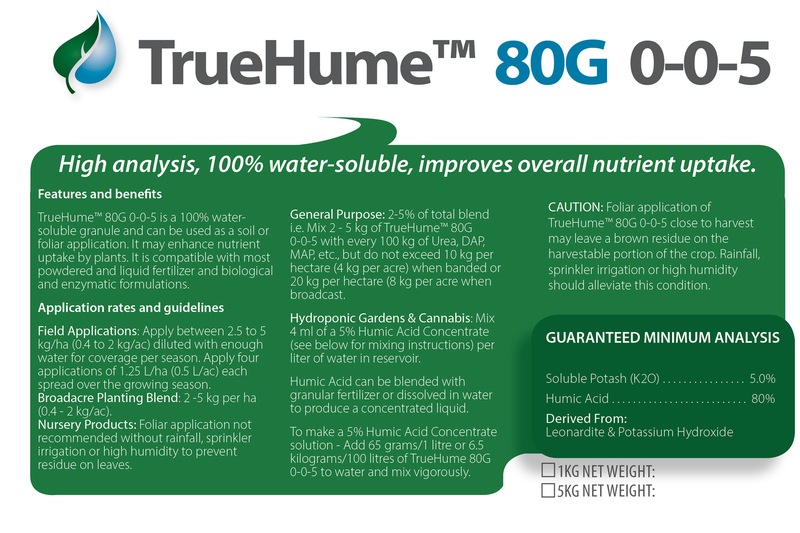 TrueHume 80G Soluble Humate Granules are made using a unique Micro-Quad filtration process that ensures total solubility. When applied directly to soil, humic acid is a powerful fungi promoter, a nitrogen stabilizer and phosphate complex agent. Along with their natural chelating and complexing properties, the ability of humates to increase permeability of cells can improve nutrient uptake by up to 40%. Humates can also buffer pH and reduce the effects of excessive elements (e.g. sodium), toxic chemicals and heavy metals. TrueHume Soluble Humate Granules are manufactured by Higrocorp Inc. (EZ-GRO).